Shares of Kohl's and Nordstrom look fairly valued -- perhaps even a bit pricey -- based on their P/E ratios. However, strong and rising free cash flow means that they have more upside than many investors realize. Following a couple of tough years, Kohl's (NYSE:KSS) and Nordstrom (NYSE:JWN) have helped lead a revival of sorts for the department-store sector over the past year. Strengthening comp sales results and rising earnings expectations helped Kohl's stock reach an all-time high last week. Meanwhile, Nordstrom stock hit a multiyear high. Indeed, Kohl's stock has roughly doubled over the past year, while Nordstrom shares have risen nearly 60% since early November. However, investors now seem to be worried that the stocks may have run too far. Kohl's and Nordstrom Stock Performance data by YCharts. It's true that shares of Kohl's and Nordstrom no longer look especially cheap based on their earnings multiples. However, earnings per share isn't the best metric for judging these maturing growth companies. Free cash flow exceeds EPS at Kohl's and Nordstrom and represents a better yardstick for measuring their value. Kohl's and Nordstrom both posted better-than-expected results in the second quarter and raised their full-year forecasts. Kohl's now expects to post adjusted EPS between $5.15 and $5.55 for fiscal 2018, while Nordstrom is calling for adjusted EPS between $3.50 and $3.65. Based on the midpoints of these updated guidance ranges, Kohl's stock trades for a little more than 14 times earnings and Nordstrom stock trades for around 17 times earnings. That puts Nordstrom's valuation roughly in line with the broader market average, while Kohl's stock trades at a slight discount. Viewed in isolation, these valuations might seem overly generous. After all, despite being buoyed by a recent surge in consumer spending, retailers face brutal competition and will need to become steadily more efficient just to maintain their existing profit margins. However, both stocks are cheaper than they appear. One of the biggest expenses for Kohl's and Nordstrom is "depreciation and amortization." This is a noncash earnings charge that spreads the cost of capital investments over the period that the assets are expected to be useful. Last year, depreciation and amortization totaled $991 million (5.2% of revenue) at Kohl's and $666 million (or 4.3% of revenue) at Nordstrom. Depreciation and amortization is a big expense item for Kohl's and Nordstrom. Image source: Kohl's. At Kohl's, depreciation and amortization expense is high because of the company's rapid national expansion over the past two decades. However, Kohl's is adding very few new stores today. It expects to spend $700 million on capex this year, mostly for technology, fulfillment, and store renovations. This gap between capex and depreciation and amortization, which has existed for several years, means that free cash flow routinely outpaces adjusted EPS at Kohl's. Leaner inventory is also contributing to Kohl's rising free cash flow. Free cash flow has also started to surpass adjusted EPS at Nordstrom in recent years. Nordstrom has invested heavily over the past decade to open new stores (including a move into Canada), spruce up existing ones, bolster its technology prowess, and expand its fulfillment network. This has driven steady growth in depreciation and amortization expense, weighing on EPS. However, the pace of capex will slow in the coming years, particularly after Nordstrom opens its Manhattan flagship store next fall. As a result, management expects free cash flow to rise from last year's $630 million to around $1 billion by fiscal 2022. While Kohl's posted adjusted EPS of $4.31 last year, free cash flow exceeded $6 per share. If anything, the divergence between EPS and free cash flow will expand in fiscal 2018. Free cash flow per share is on track to come in between $8 and $10 this year. At Nordstrom, the gap between EPS and free cash flow is narrower today but is likely to expand steadily after 2019. Based on the company's plan to buy back $3.7 billion of stock between 2018 and 2022 and management's forecast that free cash flow will reach $1 billion by the end of that period, free cash flow per share could be close to $8 by fiscal 2022. Thus, Kohl's stock trades for less than 10 times its likely 2018 free cash flow. That makes the stock look quite cheap even after its big rally over the past year. Meanwhile, Nordstrom stock is selling for less than eight times its potential 2022 free cash flow. EPS is a good metric to track most companies' financial performance. But in some cases, it can be misleading. 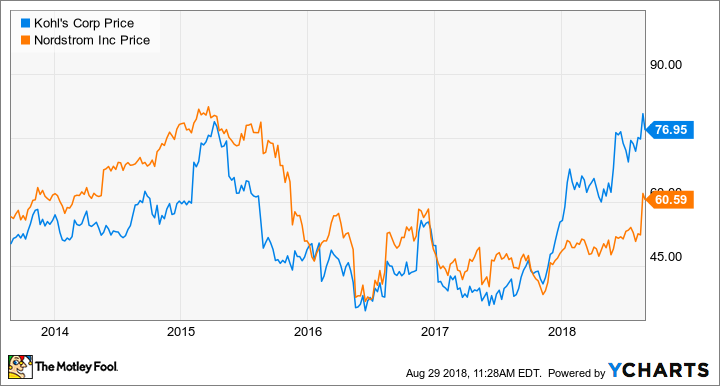 In the case of Kohl's and Nordstrom, strong and rising free cash flow means that there's far more upside for both stocks than their P/E ratios would seem to indicate.